Sharon City School District Tradition. Innovation. Excellence. Students in the Sharon City School District will soon be on their way to learning about a topic that is advancing much of society during the 21st century: robotics. The Sharon City School District is a recent recipient of a $20,000.00 STEAM (Science, Technology, Engineering, Arts and Math) grant through the Allegheny County Intermediate Unit’s Center for Creativity, $2,800 from the Sharon Lifelong Learning Council Charitable Fund, and monies from private sponsors. The purpose of the grant at Sharon is to foster and develop interest and skills to middle school students in science, technology, engineering, mathematics, and the arts through the use of robotics. The grants will fund several components throughout the district; most notably it will integrate robotics into the sixth grade science curriculum at Case Avenue Elementary. A robotics lab will be designated and will be called The Tiger Tech Robotics Lab. Fifteen EV3 LEGO Mindstorm robots will be purchased along with curriculum designed by Carnegie Mellon Robotics Academy for middle school students. A 15 week robotics and engineering unit will allow students to develop technological skills in three areas: basic and intermediate concepts of programming, mathematical and logical skills, and creative design experiences for engineering practices. In addition to the integration of EV3 Mindstorm robots, the use of Hummingbird Robotics Kits will be utilized to bring characters to life through robotics and art. Students will use Hummingbird kits to make a robot, kinetic sculpture, and/or animatronics using a combination of kit parts and arts and crafts materials. Combined with several very easy-to-use visual programming environments, the Hummingbird kits will provide a great way to continue to foster robotics and engineering skills through construction materials with which the students are already familiar. This project will be split between science and art class and will coincide with a unit in reading/writing workshop. Both the art and science teacher will collaborate accordingly for this unit, providing a unique opportunity for the students. A STEAM Showcase will be held in the spring of the year to highlight student work as well as welcome guest speakers from around the valley who work in the field of engineering to speak to the students. Students at C.M. Musser and West Hill Elementary Schools will also have a chance to learn robotics. The grant will fund two six-day summer camps at C.M. Musser Elementary School and West Hill Elementary School starting in the summer of 2016-2017. The summer camps will focus on the EV3 Mindstorm robots and a condensed version of the curriculum utilized at Case Avenue Elementary. Up to 30 fifth and sixth grade students will be able to participate at each school at no cost to the participants. On the sixth day, students will visit the Carnegie Science Center in Pittsburgh where they will continue to extend their learning about STEAM concepts. 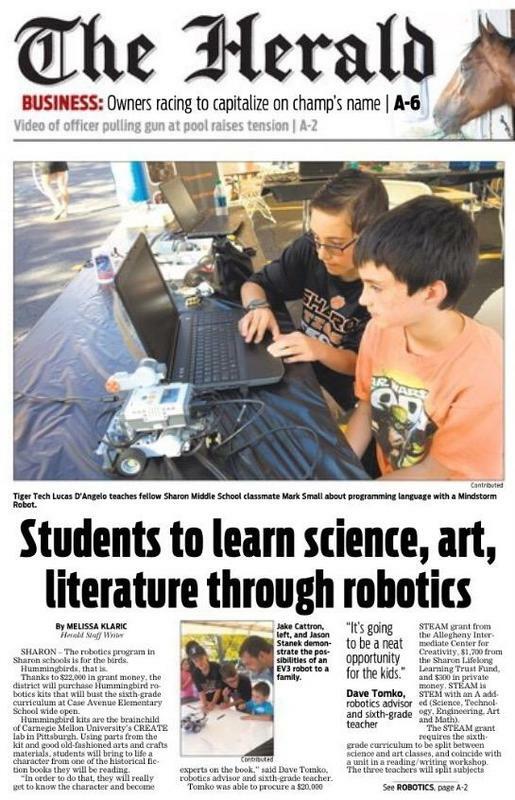 The after school robotics teams in the district will continue to expand with this opportunity. The Tiger Tech Robotics Teams are part of the FIRST LEGO League (FLL) program. FLL introduces younger students to real-world engineering challenges through the building of LEGO-based robots to complete tasks on a thematic playing surface. FLL teams, guided by their imaginations and adult coaches, discover exciting career possibilities and, through the process, learn to make positive contributions to society. In addition to the two Case Avenue Elementary/Sharon Middle School FLL teams, a third after-school FLL robotics team will be created at C.M. Musser Elementary School, funded through the Sharon Lifelong Learning Council Charitable Fund. This team will be under the direction of a newly trained coach from C.M. Elementary who will be trained at the Carnegie Mellon Robotics Academy this summer. The C.M. Musser team will join ranks with the 20 students at Case Avenue Elementary/Sharon Middle School, in addition to students on the newly formed high school robotics team that will begin to compete this coming fall. The Case Avenue-Middle School teams continue to be 100% community sponsored. The high school team will be sponsored through BEST Robotics through Grove City College. A final component of this grant will develop partnerships with the community. The FLL teams will share their learning with the community at a local summer arts festival- WaterFire Sharon, PA. Students will set up their mobile robotics lab at WaterFire Sharon. At the WaterFire children’s activity tent, the students will showcase their work and teach the community about robotics, programming and the engineering process. Local universities, such as Youngstown State University, Slippery Rock University, and the Penn State Shenango have committed to partner with this project through various aspects. An engineering professor from Youngstown State will provide time for his college students to mentor the sixth grade students at Case Avenue during science class. This will allow the college students to share their knowledge they are learning with the middle school students. A local chapter of the NSTA (National Science Teachers Association) at Slippery Rock University will provide activities for the middle school students at the STEAM Showcase planned in the spring of the year. Penn State Shenango will provide a STEAM day on campus for the sixth grade students of the entire district. Penn State faculty/students will provide hands-on STEAM activities for the students to foster excitement and interest in the STEAM fields. Additionally, Penn State will assist with the STEAM Showcase, the summer robotics camps, and the science fair at Case Avenue Elementary. Noise Solutions, a local engineering firm, will also provide time for their engineers to visit the students at Case Avenue. Their role will be to share real-life experiences in the field of engineering and to foster and develop relationships with these students by providing assistance with class projects. Out of a total of 90 applicants, Sharon is one out of 28 school districts in Allegheny, Greene, Lawrence, Mercer, Washington, and Westmoreland counties to receive the STEAM grant. The Chevron Corporation, the Claude Worthington Benedum and the Grable Foundations provided the funding. Copyright © Sharon City School District 2019. All rights reserved.